At the end of this week Twistfix will be sending out copies of our NEW catalogue which will feature all the latest products and prices for the portfolio of specialised building supplies that we have currently available. Twistfix are based in Manchester and London and have become the UKs leading supplier of damp proofing products, basement waterproofing supplies, crack stitching materials, insulation fasteners and wall ties..
Our product range is always growing as we add new and innovative materials for property construction and house renovation. 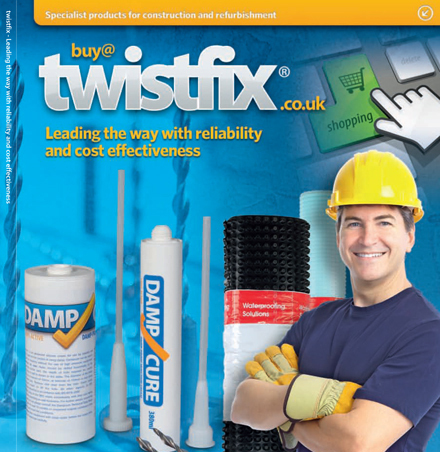 Whether you are a Twistfix registered contractor, a DIY enthusiast or a professional looking to specify high quality building supplies; make sure that you get your FREE copy today. Make sure you do not miss out and subscribe to our newsletter today. Within these newsletters you will receive information concerning specific products, special offers and promotions as well as information concerning this particular industry. Our newsletters are jammed pack full of latest news from Twistfix! For more information please contact us on 0845 1236007 or email sales@twistfix.co.uk.